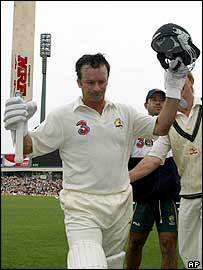 Steve Waugh bade an emotional farewell to Test cricket after his innings of 80 helped Australia secure a draw against India in Sydney. Waugh said it had been a "long journey" since making his debut as a 20-year-old against the same opponents in 1985. "I feel happy. I feel I've achieved quite a bit in this game. "I know this Australian side is a great side. I really feel privileged to have captained this side for the last four or five years." He said: "It has really made my job easier to have such a talented group of players." Cricket Australia chairman Bob Merriman paid tribute to Waugh's contribution to the game and hailed him as "not just a great Australian cricketer, but surely a great Australian". Merriman said: "Perhaps the greatest tribute a retiring cricketer can be paid is to learn that they have left the game in far better shape than when they found it. Steve, you have certainly done that. "Through your inspirational leadership and pride in representing Australia, you have helped ensure that future Test players know how special it is to wear the Baggy Green (cap)." Waugh is the most successful Test captain of all time, leading Australia to victory in 41 matches out of 57 - a success rate of 71.93 per cent - and losing only six. He also led the team in 106 one-day internationals, including the 1999 World Cup final at Lord's when Australia beat Pakistan by eight wickets. Waugh thanked the Indian team for making his final series, which ended 1-1, such a memorable one. "They played outstanding cricket. It was a fantastic series, played in the right spirit, and I know the Australian side really enjoyed the challenge. "I know they are looking forward locking horns again in about nine months time back in India." Looking back over his career, he said: "It's been a long journey, 18 years. "I was nervous the first time I played for Australia, I didn't think I'd play another Test match, so once I got 13 and five in that first Test match, I was happy with 18 runs. "To play 168 (Tests) is a massive bonus, so I'd like to thank the selectors for their patience and faith in my ability." "I couldn't have envisaged a better ending"